I agree with this review. The helmets are cool. Now it's time to beat Penn State. If you like the uniforms so much, you might as well follow them on Twitter. Can we hire a real photographer to have proper images for marketing this? What's wrong with a camera phone? I'm not sure how much I like them. I think I would have rather had the matte blue design. But I like these much more if it means we have 3 helmets that we'll use throughout the season, blended with different combo jerseys...I'm a fan of this! Pretty nice looking helmet. The Z stands out more on white than it did on gold. I can feel the winds of change. I agree 100% K92! I've liked the Z logo for a long time, and it stands out very well with a white background. It reminds me a little of UCF's helmet. I don't care if they are dressed like the guards in The Longest Yard. Just win baby! Agreed. Bowden mentioned in the tweet we'll only have white and gold. I think those are two decent options, but blue might have been a better route. I would have liked to have our Kangaroo emblem on the other side. This is a cool helmet. Those will be great for the Penn State game. 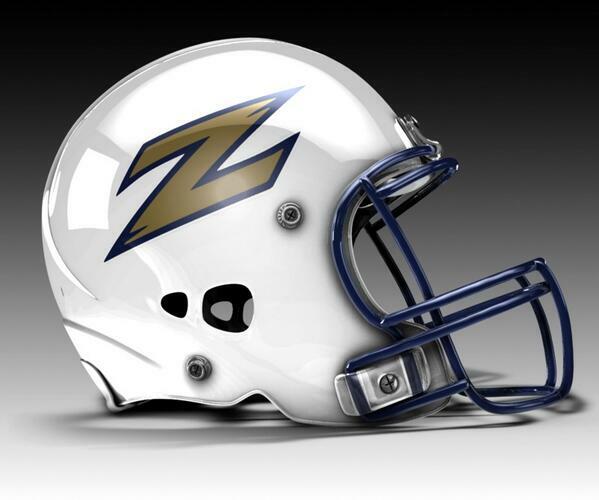 Wish we had these three Helmets next year: Gold A-Roo with the stripe, Chrome Black Z and White Z.
I'd go with Metallic gold, matte blue and white. All 3 with a big metallic Z logos on the sides. I think I am with you even though I am not a big fan of the 'Z' logo. I like the gold A-Roo the most. I also like the white even though I think a lot of other schools have already gone that way and I'd rather we be more original. I think I'd really like a white A-Roo helmet where the 'A' portion of the Roo logo was now gold. We won the MAC with our A-Roo's. Is that logo now gone from our athletic dept? Damn, lets have some kind of tradition to hold onto.